Osgood Schlatter ‘s disease is a condition that affects the small growth plate that exists at the ‘bump’ at the very top of the shin bone, directly below the kneecap (patella). The bump is called the tibial tuberosity and it is prominent because the patella tendon attaches to the bone there. The patella tendon is part of the big muscle group called the Quadriceps on the front of the thigh. At just above the knee level, the the quadriceps change from being muscle tissue (the ‘meaty’ part) to a thick, rope-like tendon that contains the kneecap within it and then runs down to attach to the shin bone at the tibial tuberosity with its bottom end. 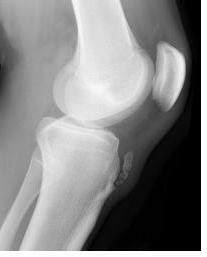 X Ray of an knee with Osgood Schlatter ‘s disease. Who gets Osgood Schlatter ‘s Disease ? Osgood–Schlatter’s disease occurs in children between the ages of 9–16 years. Around 75% of cases affect boys. It occurs in around 20% of sporty children compared to 4% of kids who fall into all activity levels. In a quarter of cases, both knees are affected and it is more likely to occur around periods of rapid growth, such as puberty. As Osgood Schlatter ‘s disease is due to irritation and damage of the growth plate, it can only occur in children while the growth plate is present. Adults cannot get Osgood Schlatter ‘s Disease as the growth plate closes over and turns into bone with skeletal maturity at the age of 16 years approximately. Why does Osgood Schlatter ‘s disease occur ? As the Quadriceps muscle on the front of the thigh contracts, the stress of this is transmitted to its attachment point at the tibial tuberosity. A good way to think of this is to imagine a rope screwed to a plaster wall. When you pull on it very hard, if everything is solid enough, nothing bad will happen. However, if its attachment to the wall is less strong than the pull exerted on the rope, a chunk of plaster will pull free. In Osgood Schlatter ‘s disease, it is the small bump of bone at the tuberosity that pulls loose. In children, the ropey tendon of the quadriceps muscle group is generally the strongest link in the chain and so a tendon injury is less common than this growth plate injury. This changes in adulthood when the bump becomes solidly fused to the shin bone and it all becomes one solid bone. A fracture of this sort where the bone is pulled off by a tendon or other soft tissue is called an avulsion fracture. The body’s response to this is to grow extra bone to shore up the area and so, people who have had Osgood Schlatter ‘s disease in childhood will usually have a more prominent bump than others. This will last a lifetime. The pain of Osgood Schlatter ‘s Disease is usually experienced when running, jumping, squatting, kneeling and going up or down stairs. It can usually be reproduced in the clinical examination by having the child try to straighten the knee out against resistance. Mechanical factors play a big role in Osgood Schlatter ‘s disease. When the feet are in ‘perfect’ alignment, the Quadriceps muscles, patella tendon, kneecap and tibial tuberosity are all pretty much in a straight line. Any force created by using the thigh muscles transmits to the tibial tuberosity in a direct, front-on direction. However, a pronated or rolled in foot will change the angle of the Quadriceps mechanism in a similar way that a knock kneed position would. The change in the angle (called the Q angle) of pull can leave the tibial tuberosity more vulnerable to damage from an angled pulling force. Osgood Schlatter ‘s disease should be initially treated with RICE (Rest, Ice, Compression, and Elevation) and some non-steroidal anti-inflammatory drugs (such as paracetamol) if needed. It is almost always possible to recommence sport in a month or so, though return to activity should be supervised by a qualified person such as a podiatrist, physiotherapist or experienced adolescent coach. Quadriceps and Hamstring muscle groups should be assessed and a stretching program designed if they are found to be tight. A podiatrist is an important part of the treatment team to assess foot function and it’s affect on the mechanical workings of the knee and thigh. Orthotics are fairly likely to be used to create a better angle of pull as discussed above. If the child is having some early signs of pain in the area, it is far better to preventatively address the problem with orthotics than to wait for a fracture to occur at the growth plate before seeking treatment. To learn more about Osgood-Schlatter’s Disease and other podiatric conditions, please use this link to return to Podiatry FAQs.